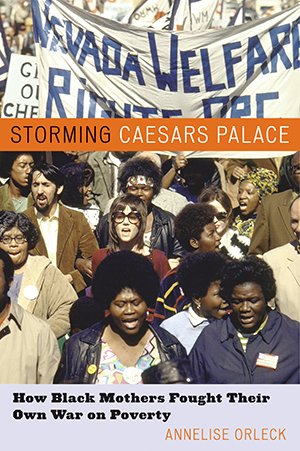 In Storming Caesars Palace, historian Annelise Orleck tells the compelling story of how a group of welfare mothers built one of this country’s most successful antipoverty programs. Declaring “We can do it and do it better,” these women proved that poor mothers are the real experts on poverty. In 1972 they founded Operation Life, which was responsible for many firsts for the poor in Las Vegas-the first library, medical center, daycare center, job training, and senior citizen housing. By the late 1970s, Operation Life was bringing millions of dollars into the community. These women became influential in Washington, DC-respected and listened to by political heavyweights such as Daniel Patrick Moynihan, Ted Kennedy, and Jimmy Carter. Though they lost their funding with the country’s move toward conservatism in the 1980s, their struggles and phenomenal triumphs still stand as a critical lesson about what can be achieved when those on welfare chart their own course.